Disclaimer: Woo-tube, not to be mistaken for Cathayan service Wu-xoob. Right, quick, with the new season around the midpoint, Terence, how are all the new teams going? Down in Redgum's Rhapsody, coach Faulcon is looking to put his Immortalis Inquietus in premier, it's the lower half of the division he's yet to face, but his 2/1/0 is not that flash yet compared to the top six, with Redgum's Rationalists, Dlock's Evil Moon Rising, HandyK's TingBuDong, Irgy's Ratty Old Elves, and Wex's Calithonian Cygnegeticus close behind. Bojo's Chrimean Chimera are even going, with the rest, JamesFynmore's Belfast Black Rats, JoeKano's Skye Hoppers, and Daudy's Beyond the Sunset, all having a rough start, with the Norse in particular at 0/0/3 feeling the pinch. Big division, the scores already looking like there'll be a couple headed to premier from here! In Karnov's Emblamatic Conf, coach Manzoo leads the way with his Snarling Lunar Freaks! on a perfect start. The old dorfs just will not leave quietly, eh. tussock's Effluvient Dervishes and Foad's Blackwater Cockfighters chasing along behind, with D_Arquebus' Lab Rat Elysium running above average. Samaranthae's South Shire Dirty Dwarfs are even going, with Grod's Veophiles, Fool's Yeast Lords, and Pdarbs' Elenium falling behind. In particular, the frogs are 0/0/4, with the worst record in the competition thus far. Tough division, mind you, no shortage of past premier champions or contenders here. Up to Ramchop's Chronicled Conf, Pyates' Waaaaghton Redskins and Jevouse's Cheasy Hadron Malaprops tied their round three to leave them tied for the run to premier on 2/1/0. Sandune's Wildwood Windlords will seek to catch them tonight with the last round three game a knife edge mirror match. Tomay's adult swim and cdwat's Sentinels are running even, with BigBullies' Refreshingly Dead, ramchop's Bravado, and Boriz's Jötenheimr Yetis in the running for relegation. The Yetis another Norse team starting 0/0/3, struggling to find that punch even with the big boy on the pitch. Then Faulcon's Quingentennial Conf, that's 500 games, it's Smegish's Dean Park Rangers leading the charge to premier alone at the top on 3/1/0, with some solid team building going on too. No one else is better than average, Bobs' Phoenix Academy Sharp Shooters, almic's Cryptic Cryptids, mushoomy's Pugs Not Drugs, polemarch's Brew Pub Brouhaha, DrPoods' Ratstar Blazers, and Sharper's Green 'n Scabby all with little to set them apart for now. Just Tribalsinner's Rolling Rampage with a tough start, the Dwarfs finding themselves 0/0/3 and a likely trip to the Regionals to beat on the new teams. Lastly, Cdwat's Heroic Conf, Relezite storming off to a solid start with Unicorn Gunfight at 3/0/1. With Wozzaa's MekLab Geargrinderz and B2K's Goonbongburra Windjammers chasing close behind, could be a tight conference indeed. GreySquirrel's Naggarond Raptors, Dunenzed's East Farkner Journeymens Club, and oozeboss's Croakland Raiders are all running even, with Karnov's Crude Oilers and JPM's Styx and Warpstones bringing up the rear. Tight at the lower end, everyone with a few points, no saying yet who'll be in a position to climb or fall from this conf. A long way to go yet, from here most of the top teams could still end up down in Reggies. Who knows? Bob Borc knows, that's who. Good luck SWL, we're out of time, and money, like most of the teams will be when the end of season bills come due. Sharp financial skills will be needed here, saving beginning in earnest for a lot of these teams now, hopeful the players and hangers on don't get their hands into the kitty. Who's richest? I hear it might just be the Khemri. I'm liking the look of them, Terence, bringing a fan club, brilliant! No one likes Khemri teams, Phillip, foul things. Got nothing on those old Goblins, if you ask me. This is the journal of Rock, a halfing chef procurer, turned Blood Bowl player-agent. Heard about some mighty fine bacon-on-legs living in the Paintree Rainforest. These pigs are reputed to be exceedingly juicy. Putting together an expedition to lay claim to these gifts to porkkind. Have assembled an expeditionary force. Enlisted Zero and Gish as security against the wild predators inhabiting the Paintree Rainforest. Also put together the best squad of halfing procurers you can find anywhere in the Southern Wastes. 13 of them, along with me, naturally. We’re gonna grab these pigs and get out of the Paintree Rainforest, and get rich! We depart tomorrow. Initial expedition TOTAL success. The weather sucked, but we ventured in the Rainforest, and got on the trail of these pigs. Unusually wide and well-formed gametrail, but that only helped us. After a day in the deep jungle, we happened on a herd of fifteen pigs. These porcine creatures was the most fattest and plumpest pork I’ve ever personally seen. We gathered them together and put them on a line. Currently leading them out. Tomorrow we reach the edge of the Rainforest, and we become the most famous Chef Procurers in all the Southern Wastes. It’s quiet. Outside of the thunder and rain (thank Nuffle for Zero and Gish’s ponchos, we’re all huddled under them right now), there’s not even any animal noises. The pigs are snuffling happily though, they definitely know they’re gonna become the most delicious bits of pork, to the acclaim of all. We woke up and set out, after butchering one of the pork for the best breakfast sausages possible. Our bellies are full. I really wonder what the Master Chefs can make out of these pigs, if we could do these sausages. Luna’s gone. Maybe she wandered away? It’s storming really badly right now. We happened on a clearing earlier today. If I didnt know that nothing lived in these forests, I would swear it was a Blood Bowl pitch. The rain is really bad, the water is waist-deep and the mud is making it impossible to slog forward, so we had Zero and Gish lift us to the canopy of the trees to try and wait out the storm. The storm finally broke, with a pair of earthshattering thunderbolts. Under our trees, there was a tribe of warrior women. They were heavily armed, threatening to kill us over the pigs (turns out we stole their herd by mistake). But thankfully, I sweet-talked them in playing a Blood Bowl game against us with the pigs going to the winner. Turns out they really love the sport, and were tired of playing it only amongst themselves. The game begins 18:00 today. I believe between Gish and Zero, we can pull it off. They defeated us roundly. Lots of injuries, several asleep. We did manage to kill one of them though! But you know what? This is a great chance to get rich. I convinced the two leaders (Genevieve and Mai) that I was an actual Blood Bowl scout, and that we came to test them. I really think this team could be something, so we- both the Amazons and us- are gonna leave the forest, to try and get them qualified for the Southern Wastes League, the finest Blood Bowl league in these lands. I got Genevieve to sign a paper saying half their proceeds will go towards the Chef Procurer team known as the Slashing Bumpkins (which is what we call ourselves!) Clever, isn’t it? Oh, and the best part? They let us keep the pigs, because that’s what they think they’re paying us for our help with getting them to play Blood Bowl on the greater stage of the SWL. Their name is pretty apt, they’re the Cloud 11 Stormbreakers, named after the two thunderbolts that ended the storm when they found us. In the lead-up to the first All Star presentation evening under the new regime, a shocking leak has occurred and the representative 11 from each Conference has been made public by the gutter-snipes in the SWL media pool. Thankfully the final 11 who have been selected to the All Stars remains embargoed, but we do know that the 11 will be selected from this list of 55 of the finest players in Season LXXI. This is a pretty powerful roster. The Mummy/Troll front line looks strong, but there's a weak-spot with the hobgoblin on the LoS. Behind that though there's plenty of blitzing power and the basis of a good running game. Despite a couple of decent catchers in the line-up you would expect Deadtask to be a thrower in name only. Another squad with a weak-point on the LoS. After the strength of Beleth and Toffee, that last position will either put at risk your skink or a positional. This team has speed to burn though, and a good selection of blitzing options. Like the Heroic squad, you would expect them to favour the running game, but that might just leave you open for a sneaky Yunge pass to Kodai. Conraua Goliath, Kroxigor, Skye Hoppers! This looks a decent squad on paper, but it would be tough to see them coming together to work as a team. Having a Kroxigor, and Ogre and a Mummy on the LoS would brutalise opponents, and Lurcher would be waiting to stomp anyone left groaning, but Descartes' animosity might trouble this team's passing game and with MaoZedong more interested in scoring than bashing they're a bit light on for blitzing options. Now here's a squad to bring the crowds back. A pair of war dancers, and a thrower to take the passing option. Norse for the ground game. A variety of blitzing options including two different flavours of werewolf. A nasty little Hobgoblin to stick the boots in. There's no really obvious LoS options though, so you'll be hoping the tree can absorb a lot of hits and protect the positionals. Beardripper, Ghoul, Snarling Lunar Freaks! Here's another strong roster. A good LoS consisting of a big lizard, an even bigger lizard, and a Tomb Guardian gives a good line of protection to the ball users behind. Omid's carrying a big responsibility for the blitzing option, and it's a bit hard to imagine Chinwendu actually putting the ball in the air, but if he did there's some good catching options downfield. They also have a few ball carrying options available, including the curiously named Bear Dripper. I guess he drips bears, or something. It says right here... bear dripper. Oh. I see it now. Beard Ripper. That makes more sense. So, imagine these squads each take the field in a tourney... which conference wins? Bravado have been quite hard to get hold of over the past few weeks. They burst onto the SWL scene full of chest-beating confidence but have been completely silent in the media since early in the season. I finally tracked down captain Kai Bollinger relaxing in the sauna of the Grande Maulbourne Deluxe. Trixi: After a disappointing season, do you have any regrets on the way you entered the toughest Blood Bowl competition in the South? Kai: Of course! We've raked in the profits on this venture. We knew the clubs over here were struggling after being duped by the Bitcoin scam, but we never dreamed how desperate they'd be. The scouting programme was a huge success, and we invested in 4 opposition stadia. There is simply no better way to view the operations of a ground than being on it. Trixi: Are you genuinely suggesting you entered SWL as a real estate venture? Kai: Absolutely. Flicked two on almost immediately for a great profit. The foolish owners of one didn't know what they were sitting on - just scratch the surface of the pitch and beneath it you find a rich vein of finest Plastique™, worth millions. West Islanders really are simpletons. We're keeping the third, need a home base. We may even let the struggling former owners rent it occasionally - they won't get to use the luxurious newly fitted out WWEBBA clubrooms though. Kai: Well that one is a bit personal. Have you ever smelt an Orc? The stench is quite simply indescribable. Everyone goes on about Necro, but we're a people of the forest, death is an inevitability and we're familiar with a smell of a rotting carcass. But Orcs! So foul! After being chased around by these disgusting brutes we were forced to endure the most unpleasant 3 hour journey back to the resort covered in their noxious sweaty ooze. Not a single shower at the Orc ground. Trixi: So you'll be redeveloping it into a better facility? Kai: Hell no! The boys will enjoy watching its demolition, call it a team building moral booster. We've offloaded it to the local council at a small loss, they'll be using it as the municipal rubbish tip. Trixi: And back to the season, on the field how do you rate how things went? Kai: Well obviously there were ups and downs. Biggest lesson learned was to not bring surveying equipment onto the field - poor Jetta was beaten over the head with it. We considered a tactical drop to Reggies. If the teams we encountered in Confs are this financially desperate, surely the ones a layer down would be even more dire - ripe for the picking. But no, I guess our pride got in the way. We'll never stoop that low. Watch for us in Prem come Season 73! Welcome to the SWL All Star presentation evening for Season 71. It’s our pleasure to invite you all here to celebrate a new beginning. SWL has begun a new season and a new era, and tonight we inaugurate the first All Star team selected from an incredible line-up of new players and new teams. As ever, all SWL players are eligible for consideration in this team. Uniquely, the league was structured without Regionals or a Premier League, but we’ve assembled 11 players with representatives from all five conferences. The first player to be named an All Star in this new era is doubly honoured tonight as the LXXI All Stars captain. Baron von Kitemonger certainly made an impression this season. His first couple of games were good, but held only a hint of what was to come. Once he found his feet in the league and realised how dangerous he could be as a scoring threat, he took his game to the next level. He scored hat-tricks against both Styx & Warpstones and Kroakland Raiders, but he saved his best performance for the Crude Oilers. His 4TDs made him a match-winner and carried his team to victory, and to Premier League qualification. He finished the season with a remarkable 14 TDs from a shade under 200 rushing yards. Astounding numbers for a player whose career spans only seven games. MaoZedong is one of the Chosen representing TingBuDong in this new league, and from the start he chose a different path from so many of the Chosen who played alongside him and who have preceded him in this game. He is as strong and as well-armoured as any warrior of chaos, but within that steel carapace beats the heart of a ball carrier. While his brethren were practising their blocking and mighty blows at training, he was gathering balls from the turf, ensuring that he wouldn’t fumble the pickup, that the ball couldn’t be stripped from his hands. In games he would put this skill to good use, rumbling up the pitch and defying his opponents to stop him from scoring. Seven times in seven games he crossed the line to score, including doubles against the Belfast Black Rats and the Ratty Old Elves. When he didn’t score, he put his other skill-set to good use causing 2 CAS against his opposition. Chinwendu the Strong was given the name before he started playing the game, but he soon proved it prophetic. Indeed, Chinwendu was strong enough to lead his team to an undefeated first season and to Premier League qualification. He too scored 7TDs from his seven games, quickly establishing himself as a crowd favourite and drawing huge crowds to Dervishes games. He scored doubles against both Elenium and the Blackwater Cockfighters, and ran for over 160 yards. A genuine star in the making. Turbo Thomas Flynn brings lightning speed and uncanny agility to the All Stars. His opening season yielded 8TDs from 126 rushing yards, and when he wasn’t scoring he was happy to turn provider, racking up 4 completions for 12 passing yards. Perhaps most remarkable for his consistency, Flynn’s star quality grew with every game he played. He scored three doubles, including in the last two games of the season against Chrimean Chimera and Calithonian Cynegeticus. Perhaps his best moment though was his completion and double in a game-turning performance against Redgum’s Rationalists in which he ran for 38 yards (more than ¼ his season total) and threw for 6 (1/2 his season total) to secure a narrow 3-2 victory. I guess the lesson here is that he loves to dominate teams with alliterative names. Which brings us to the Wildwood Windlords. The star that burns twice as bright, burns half as long, and so it was for Loeckin, who burst onto the scene with a brilliant first season, only to be forced into an early retirement by a niggling injury. The Wardancer played seven games in his career, but he achieved enough in that one season to leave the game as an All Star. His hat-trick against the SWL Sentinels was enough to ensure a 3-3 draw, and announced his arrival as a player. His 2 CAS against the Refreshingly Dead necros proved that he was as tough as he was skilful. In the 4-2 win against the Cheasy Hardon Malaprops he put together a nearly complete game, achieving a TD, a CAS and a completion from only 10 turns on the pitch. It was to be effectively his final game, with the cruel injury blow and a tight team budget forcing Sandune to make the difficult decision to retire his young star. He had a wonderfully wild, frenzied, acrobatic style, and hopefully others will follow his example. With Flynn and Loeckin downfield waiting to receive the pass, there is no one better to deliver it to them than Kai Bollinger. For some players, it might be a difficult weight to bear, carrying two such illustrious names in SWL history, but for Bollinger it is an inspiration, and like his name-sakes he has achieved All Star status. He was a reliable thrower all season, accumulating 8 completions for 35 passing yards (an average of over 4 yards per pass and 5 per game). He is the inaugural captain of Bravado, and a natural leader on the field, and as much as he is a ball player he showed his hard edge with a CAS against the Windlords. He has a long way to go before he has a trophy cabinet to match either Borgan or Kobra, each of whom had multiple All Star and Representative selections, but he’s off to a great start. Beard O Zeus is an incredible all-rounder on the field. She started her career looking like she was going to be a scorer, and quite a prolific one at that. 5 TDs in the first half of the season seemed to establish her in the team and had already put her on the All Star selection committee’s radar, but even then there are few who could have predicted her performance against the Phoenix Academy Sharp Shooters. She left the scoring to her team-mate Barbapapa that day, and instead turned her attention to the systematic destruction of her Elven opponents. She caused 5 CAS that day, of the 7 which she would cause in the season, including horrific injuries, even a fatality. And the crowds loved it. A hard-hitting blitzer for the modern game, a fierce competitor, a season LXXII Premier player, and a deserving All Star. Beithir comes into the All Stars in a curious, perhaps a unique fashion. His career began as a sneaky little stomper, scuttling and scurrying around beneath the feet of larger lizards and stamping his skinky little feet on fallen opponents. He fouled 8 times in his first season, from only 6 games. And yet this is not what makes him unique. Often players of this ilk find their niche and carve a career within it. Think of any number of players whose fouling exploits saw them sacrifice individual stardom for the team good, the appreciation of their devious coaches and the admiration of bloodthirsty fans. This was not the path for Beithir. Instead the little skink worked to become more than he was. He scored against Rolling Rampage, and having gotten the taste for glory he scored twice against Ratstar Blazers. He developed his agility and his ability to carry the ball and evade his opponents. And so, his days of fouling indiscriminately may be behind him, but we remember them fondly tonight, and we hope to see him back on the All Star stage in future. And so we come to the terrifying foundation of this mighty All Star team. In the past, it has been rare for the Big Guys to make it into this esteemed eleven. Sure, you would see a smattering in the representative squads, but to elevate oneself to true All Star status seemed a task for which many of the most massive players seemed too wild, too boneheaded, or too stupid to reliably achieve. But tonight, we induct not one big guy, not even two of them, but three! It was a tough season for the Veophiles. A 2-0-5 record wasn’t enough to convince the lizards to continue and so the team disbanded and Grod went off to coach some dwarves. But the one bright light in it all was Vorticist. The Kroxigor had an unusually good sense of the blocking game, and was able to help those around him. In 7 games he threw over 60 blocks and from these his mighty blows caused 9 CAS. His best performance was against the Snarling Lunar Freaks, who would go on to win the conference, but they won’t forget the 3 CAS Vorticist caused against them. Next to the big lizard on the All Star line is Plato. The ogre had a great first season with the Rationalists, causing 7 CAS from only 44 blocks (at an average of 1 CAS per game, or approximately every 6 blocks). His 2 CAS game against Immortalis Inquietus was good enough to earn him the MVP that day, but even better (though unrewarded by the MVP judges) was his 3 CAS performance in his team’s 2-2 draw with the Ratty Old Elves. And the final All Star named in the LXXI team is Cerberus. His namesake is the guardian of the underworld, and this troll was the guardian of the underworld denizens. He is truly a freak of nature, and a terrifying prospect for any opponent to face. Aside from the strength and regeneration common to his kind, his affinity for the dark mutatative forces of warpstone have transformed his flesh in horrific ways. Tentacles come unfurling from his body to wrap the unsuspecting victim and keep them close. Long, curved, claws have grown from his hands and arms, sharp enough to slice through leather, steel and flesh. He caused 6 CAS from 49 blocks in his first 7 games, and the way he’s going, he’ll cause a great many more before his career comes to an end. And so we present to you all, the All Stars of Season LXXI. To nominate your favourite TD/CAS/BALLSY play grab a copy of Block’s ‘n Rock’s #1 or send a pm thru to editor-at-large Karnov, Sub Editor Ramchop or let the league know in Discord or via a forum post. At season’s end, an esteemed panel of Blood Bowl luminaries will review the nominations and select the season’s greatest plays! Block’s ‘n Rock’s #1 available now at all SWL fake news outlets! *Cabalvision online subscription also available. Word out of the Crude Plains is that Coach K, enigmatic supercoach of the Crude Oilers, has turned down coaching offers from new sides in Stirland and Avelorn and committed to his current team long-term. Coach K, notorious for his team-swapping shenanigans, has seemingly been touched by the large showing of public support for his high-hatted heroes, especially after the "Slaughter at Blackwater". This outpouring of affection, along with the guarantee of absolute front-office authority, led Coach K to sign on with the Oilers for another 3 seasons. "I want to lead this team to sustained success; more importantly, however, is that I want them to be loved and adored like no other Chaos Dwarf team in SWL history. "Don't think of the Oilers as "just another" Blood Bowl team; consider them a foundation pillar of this new-born league who will not only contribute on-field, but off -field as well, with many community outreach programs in the works." We here at the Crude Plains Courier wish Coach K and the team the very best of Nuffle's blessings. Great luck and fun, Coach! Word out of the Crude Plains is that Coach K, cowardly former "coach" of the Crude Oilers, has reneged on his 3 year deal to remain with the Oilers. A source close to this reporter spotted Karnov just before dawn, fleeing town on a donkey which we can only assume is his lover. Stirland and Avelorn appear to be his most likely destinations. We here at the Crude Plains Courier wish the Crude Plains former "coach" nothing but pain & misery and failure wherever he ends up. Welcome to the SWL All Star presentation evening for Season 72. Once again this season’s announcement evening has been significantly delayed by circumstances beyond our control or ken. At times it almost feels as if some other realm, some entire other dimension or plane of existence, has so much going on in it that this little universe we have here in the Southern Wastes is affected. And yet, eventually, here we are again, happily celebrating SWL’s finest. As ever, all SWL players are eligible for consideration in this team. After a restart for the new era, the league has returned to a familiar structure, with Regionals, Conferences, and a Premier Division. We’ve assembled 11 players with representatives from all levels of this great competition. Baron von Kitemonger returns to lead the All Stars as Captain once again. While he didn’t quite hit the amazing heights of his first season, he proved he was more than a flash in the pan with 6TDs for the season in the SWL’s first Premier division of the new era. He also continued to hit career milestones, reaching over 300 career yards and scoring his 20th career TD. His agility continues to give him a range of options which normal ghouls just couldn’t take, and he has developed his game to ensure that he has safe hands and a tricky little side-step which can get him out of difficult positions. Beard O Zeus is another returning All Star. She didn’t have the same impact as a scorer this season, but she kept hitting hard and contributing to her team, achieving 5 CAS and 1TD in a difficult SWL Premier season for the Brouhaha. In a relatively short career she already stands on the verge of 100 blocks, and has a dozen CAS (at an average of 1 per game), and half-a-dozen TDs (0.5 per game). She’s a highly skilful and effective blitzer, who can hit hard and tackle, or stay in the contest and support her team-mates, and she’s once again a deserving All Star. Tertinia Titiana had an amazing season in the first Premier division of the all-new Southern Wastes League. He led the way with 7TDs from over 150 rushing yards in a break-out season. He scored twice vs Evil Moon Rising, and then stood up for the big occasion for the crucial match vs Unicorn Gunfight, his 2 TDs and a CAS decisive in the narrow win. As much as the start of his career has been characterised by his scoring, he’d started to modify his game to the more defensive aspects, training herself to tackle his opponents, or to strip the ball loose whenever he gets the chance to hit the ball-carrier. A real all-rounder in the making. Secundus Pescennius Caprarius was a consistent and significant presence in the Immortalis team. He managed to inflict 5 CAS in the season, and on five different opponents. He has thrown over 100 career blocks, at an average of approximately 8 per game, and even proven himself a scoring threat with a TD all the way back in season LXXI. Solid and dependable, with a knack for helping out his team-mates in the trenches and an ability to make himself almost immovable no matter what his opponents throw at him, he takes a powerful place in this season’s All Star line-up. Mouse Haus had proven himself a capable scorer in his first season, but even the veteran pundits and the most bullish Norse fans would have struggled to predict how successfully he would build on that foundation in his second. Competing in the Conferences, Haus scored an incredible 10TDs from 6 games, scoring a brace on 4 consecutive occasions. In doing so, he took his career rushing tally past 250 yards and established a career average scoring rate approaching 1.5 TDs per game. He does it the old-fashioned way too, more a skilled baller than a pure athlete. He has sure hands and is incredibly difficult to bring to ground, and contributes in defence as well, using his strong tackling to bring opponents to ground. Groggus Barrelbrewer comes from a famous barrel brewing family who have brewed barrels (a strange and arcane art which I couldn’t even begin to explain here) for generations. But his path has led him to the SWL and the game is richer for his decision to turn his back on the brewing of barrels. He proved a consistent scorer in the Regional division this season, finishing with 10 TDs for the season and scoring twice in three separate games. In doing so, he brought his career rushing tally to a remarkable 367 yards, at an average of over 26 yards per game. He can block and dodge with the best of them, and has a burst of speed when sitting under the kick-off which allowed him to position himself well with the ball in hand and grind up-field over and over again. An exceptional exponent of the ground-game, we welcome him tonight to join the ranks of the All Stars. For those more interested in the aerial game than the ground game, Stev’o Yunge wins the right to command the All Stars backfield after an impressive season of throwing passes for the Rangers. He finished with over 100 passing yards for the season, from 15 completions, at a rate of 7.2 passing yards per completion. His game against the Yeast Lords particularly stood out, with his 5 completions for 35 yards establishing the dominance needed to run out with a 5-2 win in a battle of the elfs. This season he took his career total past 20 completions, was clearly the safest and most accurate thrower in all of the SWL. Dan Dan takes his name from two mainstays of past SWL All Star teams, and he continues their legacy with his selection this season. He plays a different game from either of those previous “Dan”s though, and as much as he is a potent scoring threat, his real talent is in the spilling of blood. He is selected tonight for a thoroughly un-elfish 10 CAS season. What perhaps makes this feat most remarkable, was that coming into the season he had never caused a CAS, and even early in LXXII he was more interested in the ball than in breaking his opponents’ bones. But a CAS against Lab Rat Elysium whet his appetite, and he went on to cause 3 against the Cryptic Cryptids and then 3 more against TingBuDong. When a player can leap, block, tackle, wrestle, and draw blood from rats and beatsmen alike, you best believe he’s an All Star. Not to be out-done by an elf, Spike Hunchback had to go one better than Dan Dan and finished the Conference season with 11 CAS. He established the pattern of his play early in the season, with a dominant display causing 4 CAS against the East Farkner Journeymen, and then 3 more against the Norse from Beyond the Sunset. He’s a small package full of big hits. As strong as a Saurus, and tough as an old boot. He has over 100 career blocks at over 8 per game and looks to be well-positioned to establish himself as one of the most feared fighters in the SWL. Certainly he’s already established himself as one of this season’s All Stars. One player who might also challenge for the title of most feared in the League is Salamoneus. He’s a little rat with a big appetite for warpstone. Warpstone and blood. He also scored 11 CAS in an amazing Regional season, but he also showed that he could play ball, scoring 3 TDs late in the season. On two occasions he inflicted 3 CAS: firstly vs the Lollipop Guild, and again vs the Yetis. He has horns and claws and he can inflict mighty blows on his opponents, but as a ball-carrier he is difficult to get to ground and always a risk of injuring those who dare to stand in his way. With over 150 blocks from 14 games (at over 10 blocks and 1 CAS as an average) he’s a promising young player and a season LXXII All Star. And if Salamoneus doesn’t get you with the hit, beware for Arethusa coming in with the stomping boot. It’s unusual to see three All Stars selected from the Regional division, but this little Goblin had a season which was impossible for the All Star selectors to ignore. 29 fouls is, in and of itself, an amazing achievement. He nearly doubled the tally of the foulest Conference player and was more than 3.5 times as foul as any of the Premier. But even more remarkable is his ability to hide these nefarious activities from the authorities. These 29 fouls came from only 56 turns on field for the season. An absolutely unremarkable player to look at (and perhaps this anonymity is part of the threat), but he completes the All Star 'LoS' nonetheless. And so we present to you all, these eleven player, the All Stars of Season LXXII. Passing yards (40): Skye Hoppers! Today's program is brought to you in association with Crikey. 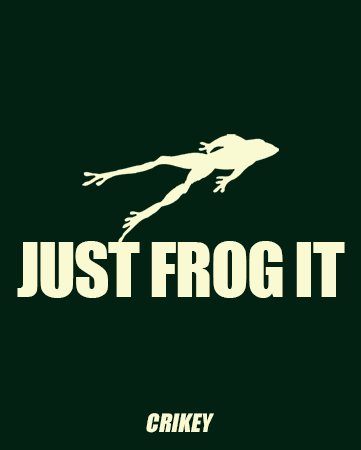 The brand for all your bipedian amphibian needs. Lab equiqment sabotaged! A whole new GENeration left to be flushed down the toile... erm, disposed of in an environmentally sound way....! The smell of burning electronical gear permeated the room as coach D_Arquebus was left to ponder... was it really just that "fear was an option"....? Kills (2): 4 teams on 2 kills.